Or have you ever craved chocolate cake but didn’t want the processed-sugar overload of the real deal? I have just the thing! Behold the fudgy NO-BAKE Chocolate Cake BITE that’s naturally sweetened and easy to make! Let’s (not) bake! 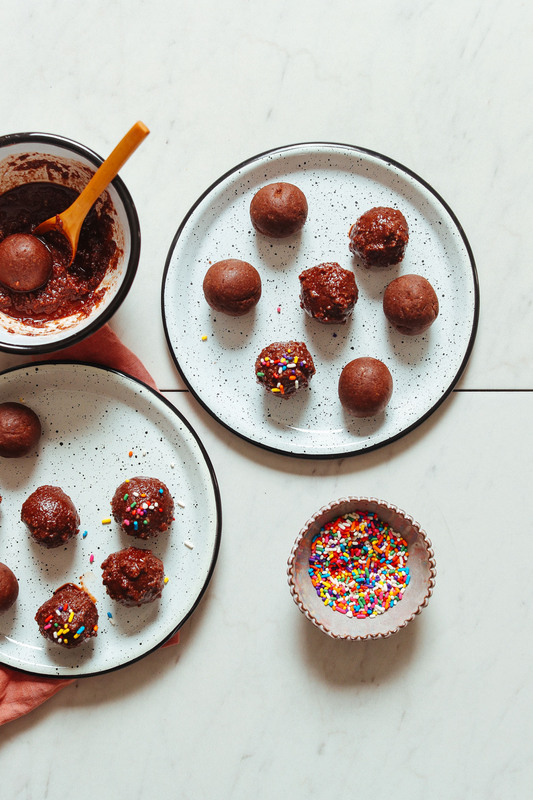 These cake balls require just 7 ingredients (not including the glaze) and 30 minutes to make! Plus, they’re made with simple ingredients you likely have on hand right now. The base starts with dates that are blended into a ball. 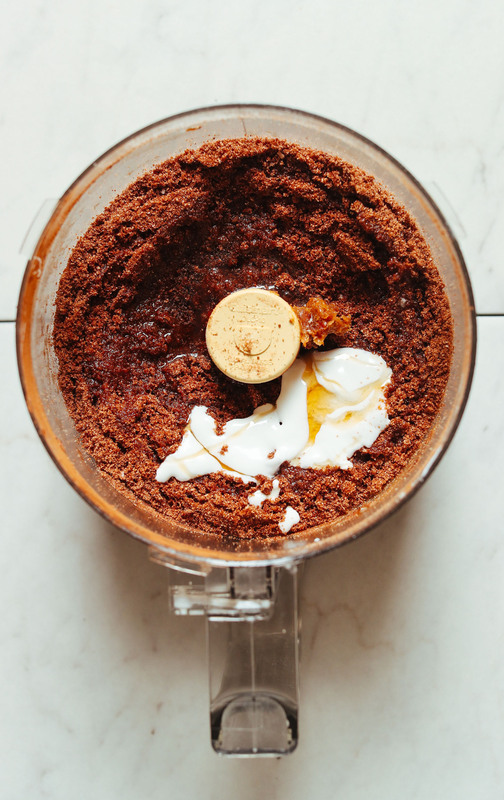 Then dry ingredients like coconut flour, almond flour, and cacao powder are mixed to create a fluffy, chocolate cake-like texture and flavor. Then the two are mixed together. The final additions? Vanilla extract for that real cake-like flavor, maple syrup for even more (natural) sweetness, and coconut cream for a little fudginess. Swoon! 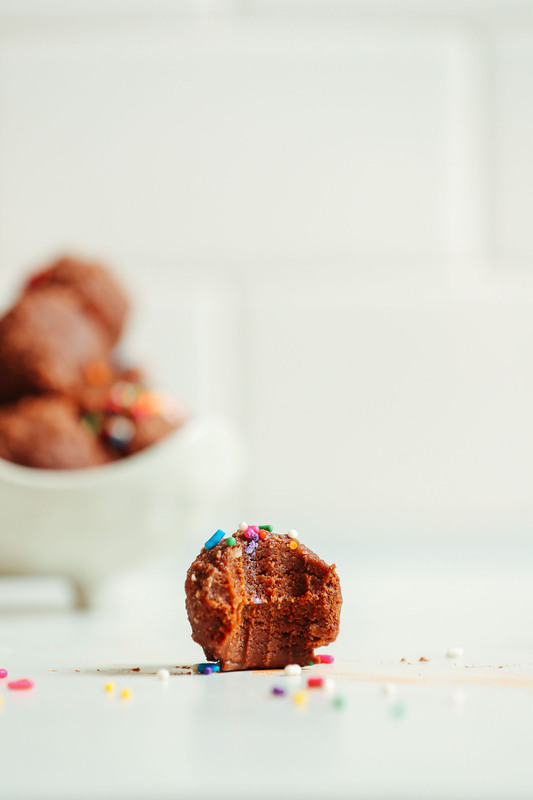 Once your “cake batter” is formed into a loose dough, scoop into cake bites and chill. At this point, you can enjoy! Or, if you want to go the extra mile, I’ve included not one but TWO glaze options below! The first uses coconut butter for more of a chunky glaze (pictured below), and the second is silky and smooth like ganache. You can’t lose either way! These would make the perfect healthier treat to have on hand throughout the week when dessert cravings strike! They’re also wholesome and hearty enough to pass as a snack (in our opinion), which makes them great for on-the-go energy bites. If you’re into cake bites, also be sure to check out our Vanilla Cake Bites! And also our PB&J Energy Bites, Dark Chocolate Hemp Energy Bites, and PB Cup Energy Bites. If you try this recipe, leave a comment, rate it, and tag a photo #minimalistbaker on Instagram so we can see what you come up with. Cheers, friends! 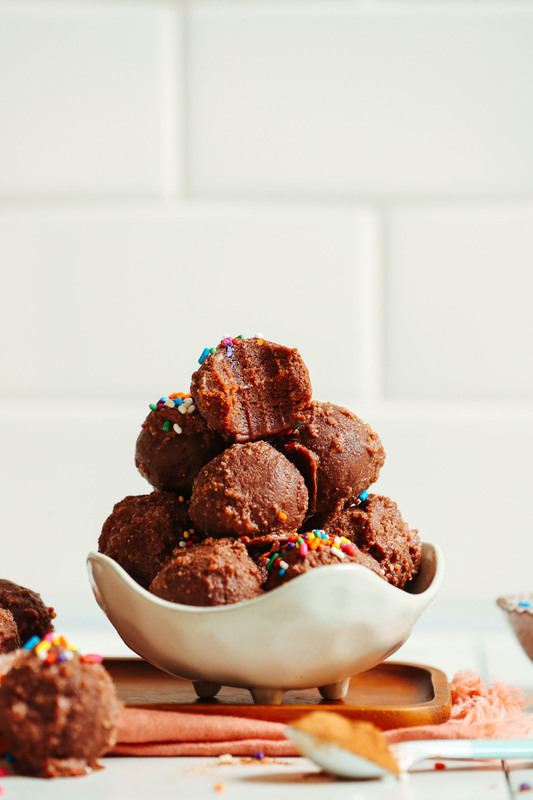 Fudgy chocolate cake bites that are vegan, gluten-free, grain-free and naturally sweetened! Just 7 ingredients required for this healthier dessert or snack! 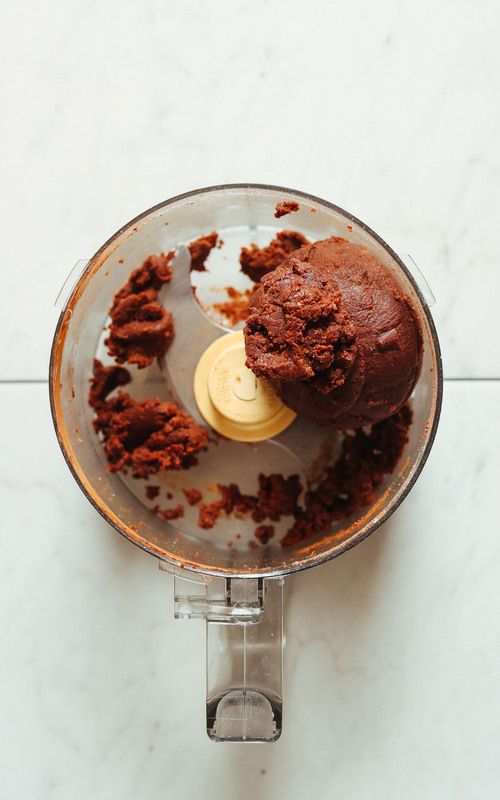 To the food processor, add your almond flour, coconut flour, and cacao powder. Blend until a fine meal is achieved - about 20-30 seconds. Add the dates back in along with the vanilla extract, maple syrup, and coconut cream. Blend until a tacky dough forms. If it’s too dry, add a little more maple syrup. If it gets too wet or sticky, add more coconut flour as needed. In the meantime, prepare glaze by adding all ingredients to a mixing bowl and stirring thoroughly to combine. This is meant to be a semi-thick glaze with some texture. For a smoother, more ganache-like glaze, see notes. Remove cake bites from the freezer, and one at a time, dip cake bites into the glaze. Lift up with a fork or slotted spoon and tap off any excess glaze. Place back on the parchment paper to dry. Repeat until all cake bites are glazed. Then carefully transfer back to the freezer to set - about 10 minutes. Enjoy! Store leftovers covered in the refrigerator or freezer (up to 1 month). Serve slightly chilled or at room temperature (but if too warm, the glaze can get soft). 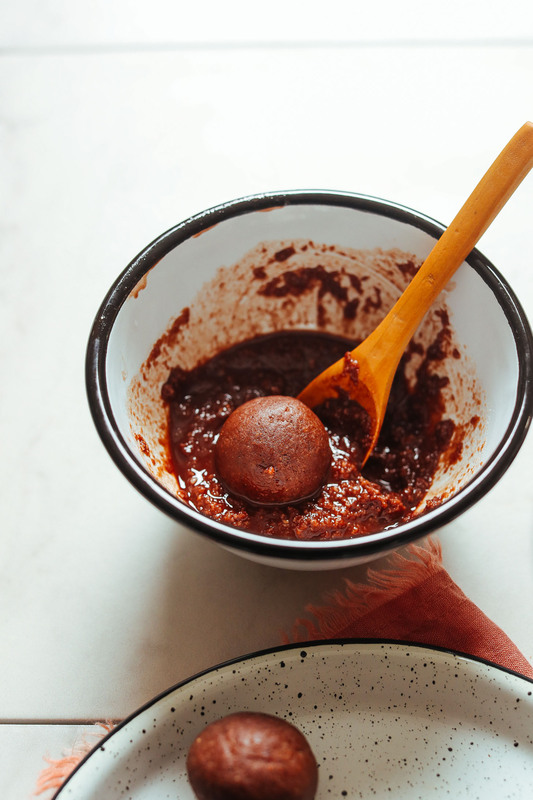 *For a smoother more “ganache-like” glaze, combine 3 Tbsp (45 ml) melted coconut oil with 2 Tbsp (12g) cacao powder, 1 Tbsp (15 ml) maple syrup, and a pinch sea salt and stir to combine. Multiply as needed. *Nutrition information is a rough estimate calculated without glaze. *Sprinkles optional. Ensure vegan and gluten-free as needed if using. We are allergic to coconut ….what can I use instead? Thank you. Hi Francine, For the oil, just use olive oil. For the milk, just use almond or rice milk. To avoid the coconut flour you can try subbing in some oat or cassava flour OR just all almond. Hope that helps! I don’t like to cook (I’d rather be outside with my plants, cows, horses and dogs!) but I try your recipes because they’re so easy and delicious! I live in South America where there is no maple syrup. But lots of honey! Can I sub with it? Same amount? I love your sense of humor, ideas, photography….just everything! Btw I’m a chocoholic! Thanks so much for your kind words! Honey should work! OMG it worked it was easy and it tasted like they said it would – hell yeah! These are now my go to make my own bliss balls for a happier healthier child and family! This chocolatey, meltey, gooey creation of yours is very addictive. I cleaned the bowl out with my spatula and mouth after I was done making the little balls of insanity. Generally speaking, if we were to put all the healthy advantages of your recipes aside, everything is absolutely delicious. I have been eating the bliss out thai salad for months even without the tempeh and still receive tons of joy eating it. Thank you and your staff for being dedicated and putting 100% into doing what you obviously enjoy!!! This No Bake Fudgy Chocolatte Cake Bites is perfect for a little halloween treat, Dana. I will definitely try this at home, though I’m a bit concerned with the coconut milk. Can I use a low-fat milk instead of the full-fat? Thank you! Have you tried freezing and thawing these. Interested in backing a large batch. 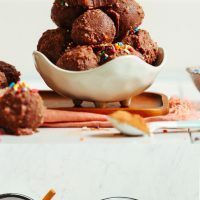 I’ve made all three of your cake ball recipes and this one is my favourite!!! They’re all amazing but the chocolate with the ganache… oh yes. Thank you so much! Hi Dana, my whole family are huge fans of whatever magic you create. Seriously, we have trans Pacific and Antlatic gushing sessions about your recipes. I have a budding 13yr old pastry chef nephew, who lives with a sister who can’t have a lot of fatty refined sugary treats. We want to get him a bday cookbook. A) do you have a pastry/ baking cookbook or B) have one you can recommend? SO, so kind! Thanks for sharing! A) we don’t have a pastry cookbook, just our Everyday Cooking, which does have desserts (but isn’t necessarily low fat). And B), I’m sorry I don’t! Awesome treat for that afternoon pick me up! Thanks for the super recipe, you’re a Star!! Thank you for not only making me happy but my kids happy too! Can someone tell me how cane or beet sugar , being evaporated cane or beet juice, us less natural than maple syrup or pureed dates ? Dates have fibre to go along with the fructose and glucose in them. Beet sugar is sucrose (fructose and glucose), but there is no fibre or other components, like water found in the fruit, to go along with it. I am pretty sure that sugar with fibre is better for the body than plain sugar without the fibre. I am not sure why maple syrup is considered better than regular sugar other than the fact that maple syrup has antioxidant and anti-inflammatory properties. Maple syrup is refined maple water/sap, so there is a refining process involved. Didn’t you used to include weight measurements on your recipes? I so appreciate that, as I feel it is the best way to most accurately replicate your experience with the recipe. Still excited to make these to celebrate my son’s 4th birthday next weekend. He will love them, especially dipped in chocolate with sprinkles on top. Yes! Thanks for sharing, Simon. There’s an option above the ingredients to toggle between metric and standard. I followed your recipe exactly, and these are perfection!!! Hiding one in the kid’s lunches tomorrow as a treat that I feel good about giving them. Thank you! What is the difference between using whole wheat or regular flour vs the almond and coconut flour you are using for the recipe? I noticed some comments used ground almonds instead – would this just mean processing whole almonds until ground? Hi Tina! We haven’t tried using regular flour in this recipe, but if you do let us know! 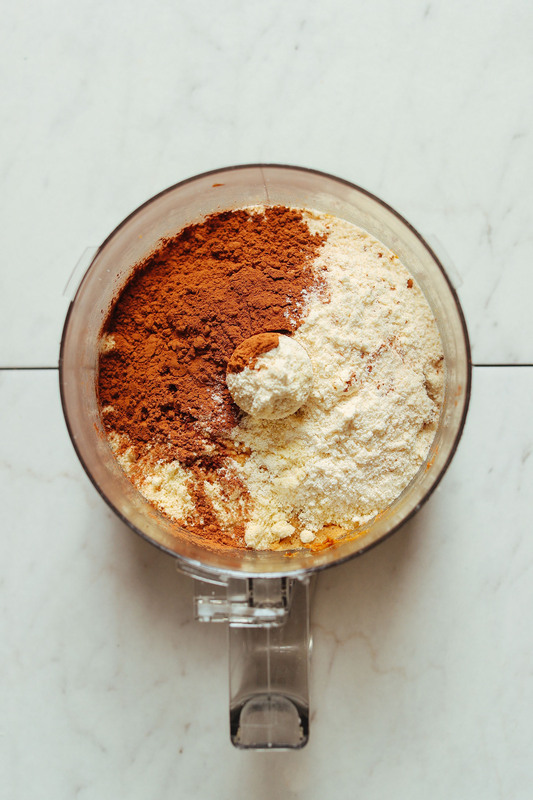 As for almond flour, you can make your own by grinding down almonds or purchase it already ground. Lastly, agave should work but we haven’t tried it ourselves in this recipe and can’t say for sure! Let us know if you experiment! Good luck! Can I just throw everything in my vitamix all at once and tamper if needed? 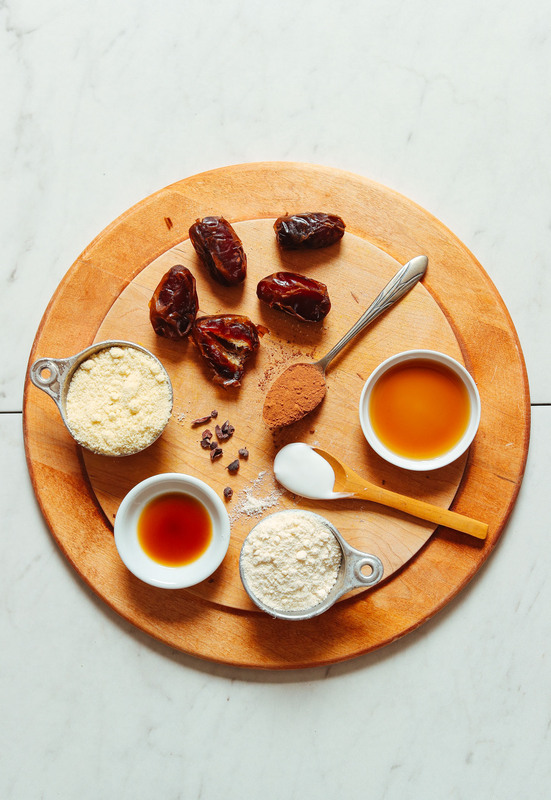 Have problems doing just a cup of dates as its too small of an amount to blend in a big blender. You could try, but I’m not sure how it would work! Let us know how it goes, Matt! Delicious! I just used ground almonds as I didn’t have either flours, but they were still very tasty. Smart! Thanks for sharing, Becca! I have cocao powder. Do they other ingredients hide the bitterness well? Or is there a particular brand you recommend? Thanks for sharing, Ilene! The coconut glaze is a little on the thicker side. Next time try the ganache! What?! Yes!! 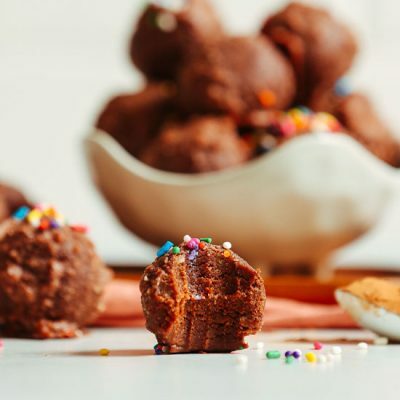 Clean eating cake bites… I am onboard, Dana. Genius! Yay! We hope you love them, Kathleen! I work in a school that’s nut free and I’m always looking for simple vegan ideas. Can you suggest something to replace Almond flour? Would 100% coconut flour work? Thank you for getting back to me. Hi Anne! I’d say try for all coconut flour OR sub the almond flour with oat flour. We try to answer them all! Oh my! these truffles look amazing. Trying your recipe super soon. What can you sub out for the almond flour so I can send these to school for my kid?? I’d say try for all coconut flour OR sub the almond flour with oat flour. Honestly, I would just eat that cake dough on its own before rolling it into balls. It looks so creamy and delectable! What a beautiful recipe, as always, Queen of Treats! The ganache firmed up a bit towards the end so the last few have more of a textured finish. I’m guessing I could have reheated it a bit if that mattered to me. Hi I’m a low fat plant base so I don’t use oil. What can I sub with as usually in baking , you can use apple sauce to replace oil. Not sure about apple sauce here , any ideas? Just skip the oil and use more coconut cream! Most likely you’d be avoiding coconut cream on a low-fat / no-oil plant-based diet. Between the dates and sugar, you might be able to completely skip the oil/fat and still do ok. The energy bites that I make are only held together with dates, water, and peanut butter (higher fat). I made these yesterday as soon as I saw the post on Instagram! SUPER GOOD! The texture is pretty dense and more fudgey (than cakey), but I love that. They are DELICIOUS and so easy to make!!! Bravo, bravo (always!). I love all your recipes, but I’m allergic to coconut. Any recommendations on subbing out coconut oil/milk in this recipe? I am not vegan, so even dairy that could work? For the oil, just use olive oil. For the milk, just use almond or rice milk. To avoid the coconut flour you can try subbing in some oat or cassava flour OR just all almond. Hope that helps! These sound delicious! Can’t wait to try it! Thank you so much for posting! Can I sub cassava flour for almond flour? These sound amazing! Is there something you would recommend subbing for the almond flour? I have a nut allergy. I’d say try for all coconut OR a little oat flour. I did all coconut—absorbs too much moisture-so there is no cakeyness…now trying to sort out how to save them. Any tips? Pulse again with more liquid or maybe coconut oil? ok-i soaked 7 dates in hot water and pulsed with the water, added coconut oil (about a tbsp), more cocoa powder, vanilla and maple syrup (to taste) and 2 tbsp homemade sunbutter. Texture is better! But not chocolatey enough yet. Think the glaze will help with that! Do you think I could sub more dates for the maple syrup? I’m trying to go sweetener-free. Thanks! Technically yes, but know that the maple syrup adds a certain kind of sweetness and moisture that makes these more cakey and less like a brownie. I used 100% pure date syrup instead of maple syrup (because I didn’t have any) and they came out delicious! A bit sticky, so more brownie/fudge like as mentioned above. Still – yum yum. Maybe start with 2 1/2 – 3 tbsp date syrup then add more as needed. Will roll some in hemp seeds so I don’t feel totally guilty for devouring them ;) Thanks for the great treat! Can you sub regular flour? We haven’t tried that, but if you do let us know! Hi. Maybe raw regular flour is not a good idea — please check CDC advise in regards to that! Or please don’t try that? As these are not baked? Please bring back BAKED things!!! haha, there’s plenty of that to come. I’m so in love with all your recipes! They are my “go to” for every occasion!